Are Skinks Poisonous to Cats? A five-lined skink doesn't always have a blue tail. A persistent popular conviction in the southeastern United States maintains that the five-lined skink or "blue-tailed lizard" is poisonous to cats. The scientific and veterinary communities, meanwhile, remain divided on this issue. The lizard with the bright blue tail, like the Tar Baby, don' say nuffin'. 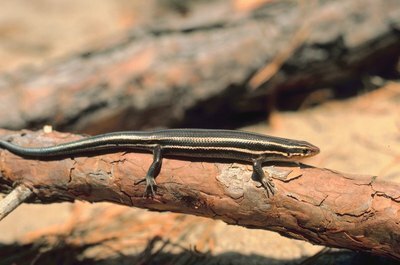 The five-lined skink (Eumeces fasciatus) has a bright blue tail as a hatchling. This colorful appendage is commonly supposed to be venomous or at least toxic. Some people believe the blue color is a warning that the tail is poisonous; some believe, demonstrably incorrectly, it carries a stinger. Some believers say poison is in the lizard's skin and some in its flesh, while unbelievers pooh-pooh the whole idea, saying their pets eat lizards regularly with no ill effects. Neurological signs, such as excitability and drooling, in a cat can be attributed to causes other than than eating lizard tails. Most if not all cats find little zippy black-and-cream-striped lizards fascinating, and many show a strong desire to chase them,just as they would any small and fast-moving object. Cats have also been observed to catch and eat them with no demonstrable aftereffects -- but the Southernism "poor as a lizard-eating cat" suggests lizards are not at the top of the feline menu. Some cats avoid adult skinks, probably due to having been nipped by lizards who were acting in self-defense. Lizard-eating is popularly viewed as the cause of a constellation of symptoms, including hypersalivation, vomiting, fever, loss of appetite, loss of coordination and even death. The Merck Veterinary Manual, however, attributes "lizard poisoning" syndrome to severe infestation by Platynosomum concinnum, a liver fluke. Lizard poisoning is described by pet owners as the cause of vestibular clinical signs such as dizziness, imbalance and head tilt, but this is not the only cause of these problems. The same symptoms can be caused by a respiratory infection, or even idiopathic vestibular disease; "idiopathic" is a medical term meaning something that just happens and we don't know why. In short, There is no scientific documentation that blue-tailed skinks are toxic to cats, but there are a lot of claims that they are. What Types of Cats Have Blue Eyes? What Kind of Lizards Are Deadly to Cats When Ingested?